Stanbic IBTC pledges to maintain gender-balanced workforce – Stanbic IBTC, a member of Standard Bank Group, has again highlighted its resolve to maintain a gender-balanced workforce to ensure it continues to provide quality financial services to clients and Nigerians. The pledge was given at the 2019 Stanbic IBTC Blue Women Network (BWN) fifth anniversary event held in Lagos. The BWN, inaugurated five years ago, has consistently organised the BWN event to commemorate the yearly International Women’s Day (IWD) celebrations. The 2019 IWD theme, “#BalanceForBetter” was a significant opportunity for Stanbic IBTC to celebrate its gender-balanced workforce and its efforts to promote a gender-balanced workplace in society. The Chief Executive, Stanbic IBTC Holdings PLC, Mr Yinka Sanni, in his opening speech at the BWN event, said Stanbic IBTC is proud to showcase not only its equal opportunity policy, but also its efforts to promote a gender-balanced workplace in society. “In our 30-year history, we have always insisted on equal opportunity. We have also continued to lead the charge in empowering women. This gives me joy and is something that we are fully committed to as an organization,” Sanni said. In line with the balance theme, Founder/CEO of Channels TV, Mr John Momoh, and the Executive Secretary, Nigerian Investment Promotion Commission, Mrs Yewande Sadiku, who was an ED in Stanbic IBTC before joining government, acted as resource persons for the event. Momoh narrated how he started Channels TV with his wife and how his equal opportunity policy has helped to catapult the TV station to the top of the pile in television programming. Sadiku drew on her over 21-years of work experience with Stanbic IBTC and how she was never discriminated against based on her gender to encourage members of the BWN, especially the young ones, to remain hard working, dedicated, focussed, and creative in their duties. She urged them to take advantage of the opportunity provided by Stanbic IBTC to advance their career while admonishing them not to use their gender as an excuse to be sloppy at work. The chairperson of BWN, Nike Bajomo, who is an executive director, said women have a duty to be diligent at work and be positive about career growth, otherwise, the famed glass ceiling will limit advancement. “I urge you to do your bit to ensure that the future for the female folk is positive, equal, safe and fulfilling. I don’t see glass ceilings preventing me from attaining success. If you do, then you are getting in your own way,” Bajomo said. 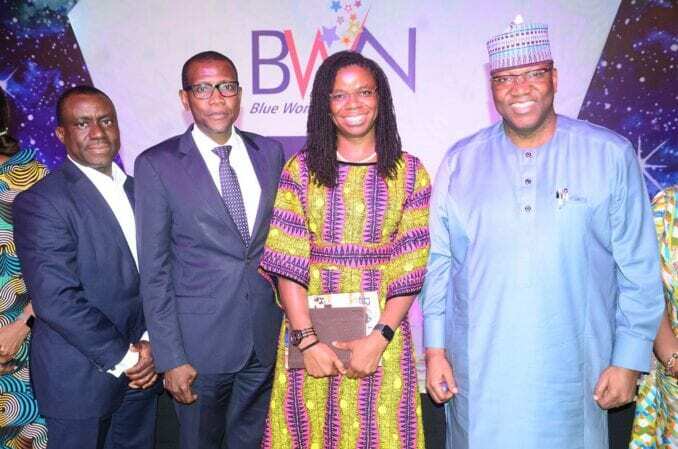 The 2019 edition of the Blue Women Network magazine was officially unveiled at the event. The BWN is an initiative of Stanbic IBTC – with a focus on deliberately driving career growth and development of Stanbic IBTC women. 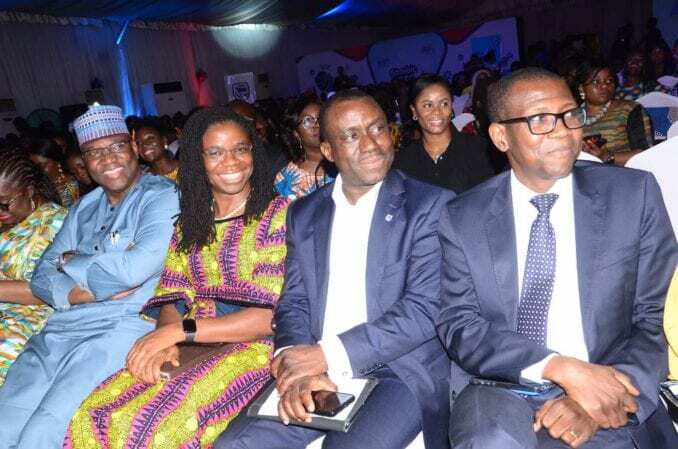 In a show of its commitment to gender equality, Stanbic IBTC made a bold statement on the International Women’s Day (March 8) by changing the colour of its logos which are predominantly blue, to magenta on most of its digital platforms. Magenta is the colour of the UN Women ‘HeForShe’ brand. 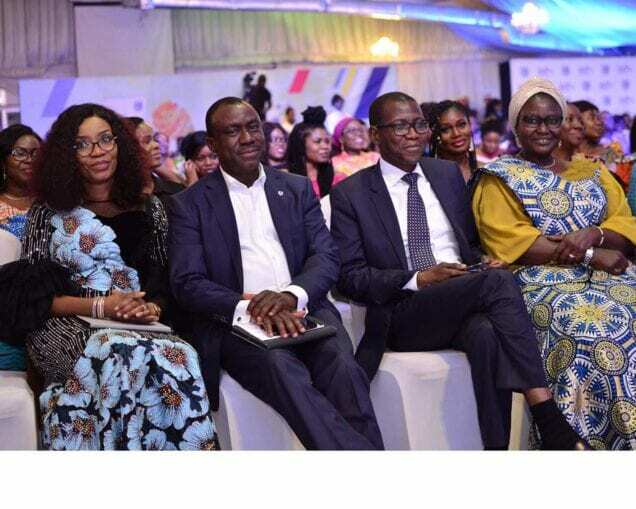 L-R: Chief Executive, Stanbic IBTC Holdings PLC, Mr Yinka Sanni; Executive Director, Business Development, Stanbic IBTC Pension Managers Limited, Mrs Nike Bajomo; and Chief Executive, Stanbic IBTC Bank PLC, Dr Demola Sogunle, at the Blue Women Network event held by Stanbic IBTC to commemorate the International Women’s Day, in Lagos. As part of activities to mark the IWD 2019, the Stanbic IBTC Blue Lab, which has as one of its mandate the task to build affinity within the technology ecosystem through events targeted at building capacity/providing insights, hosted a panel discussion session tagged ‘Women in Tech’ on Saturday 16 March 2019. The event provided a veritable platform for the financial institution to educate young females who work in technology field through the experiences and career learning of select speakers. On the panel were Helen Udoh, Head, Quality Assurance and Software Testing, Stanbic IBTC, Amaka Nwosu, Head, Mobile Channels and Acquiring, Stanbic IBTC, Temidayo Ominiyi, Head, Product Assurance and Customer Care, Stanbic IBTC, and Foluso Gbadamosi, Director, Product Business Process and Technology, Prime Atlantic Group. Bridget Oyefeso-Odusami, Head, Marketing and Communications, Stanbic IBTC, in her opening address, stressed the importance of women supporting each other and creating balance in the workspace. The well attended session was both engaging and inspirational.